A photo taken by the AP’s Daniel Ochoa de Olza on Thursday of Honduran illegal aliens from the migrant caravan climbing over a skimpy border fence from Tijuana, Mexico into the U.S. near San Diego as a Border Patrol agent just stands there doing nothing to stop them is the perfect example of how utterly ineffective security is at the border. This is what President Trump is talking about when he rails against current immigration laws and border policies that encourage and welcome illegal aliens. 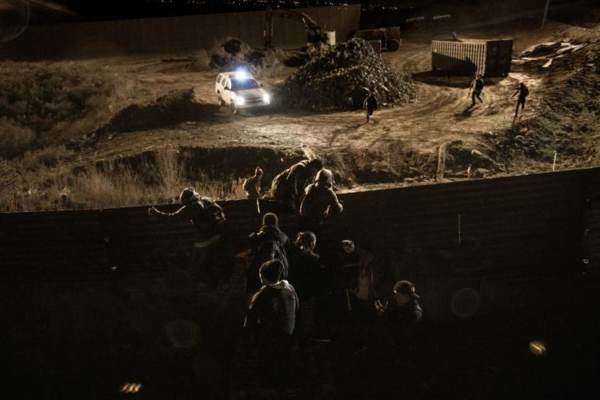 Border Patrol agents are powerless to stop the illegal aliens even as they climb over the fence that is supposed to protect the nation’s border. They can’t even use pugil sticks with heavy padding to gently push the invading aliens back off the fence as they try to climb over. Other photos taken by Daniel Ochoa de Olza from the San Diego border last week show other groups of migrants climbing over the border fence and evading a Border Patrol agent who tried to capture them after not stopping them as they climbed the fence. 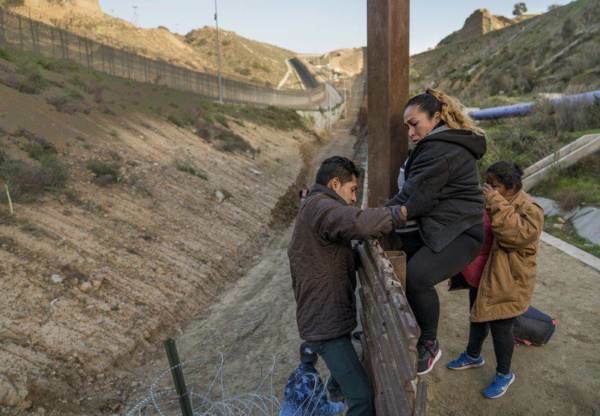 These illegal aliens apparently were not interested in making bogus asylum claims like so many others in the caravan and chose to run past the lone Border Patrol agent. Click this link to view the photos. POLL: Should Trump Shut Down The Southern Border? This video from Thursday shows illegal aliens climbing over the fence at Tijuana in broad daylight. At one point, a Border Patrol agent doesn’t even try to stop the group. Presumably he told them to wait at his vehicle (aka the Welcome Wagon) as he went to the fence to receive other invaders. CBS News posted a screen capture from the video. ABC News posted the video on Facebook but cut it a little short. Closing photo from last week of the out-of-control border and immigration system President Trump is trying to fix: A migrant woman, pregnant with her anchor baby, climbs the border fence at Tijuana to illegally enter the U.S., photographed by the AP’s Daniel Ochoa de Olza. The Democrats have vowed to not fully fund the government until President Trump and the Republicans drop their demand for an effective border wall and fencing. Like with Bush and Obama we are be played again by Trump. There is no enforcement just the North American union marching on under different names.